I have just started working with the angelic invocations from the Heptameron again, calling upon the angel of the day and the spirits of the air. I may put some of these up on my blog in due time, but for now I will share some of the workings I did using these invocations in January at the beginning of this year. Before I do this I need to explain the way I have learned to understand the nature of these spirits, and how I applied this knowledge to help me with what I was seeking to achieve. The few who know me personally and my way of understanding and practising magic, know that I am particularly fond of allegorical symbolism, which is the language of spiritual knowledge and is used in mythological writings, the scriptures, alchemy, and also ceremonial magic. Although, it seems to be much less applied by current practitioners to the workings of the ceremonial magic that is found in the grimoires. This seems to be because many seem to be inclined to read the literal interpretation of these texts instead. The allegorical language is also called the language of the gods and the language of the birds, this is because the bird is a universal symbol for spirit because it can be seen to reach the heights of heaven as it flies through the air, which, as was pointed out in one of my previous articles; the word for “spirit” in many languages is the same as is used for air, wind and breath. It is also worth taking into consideration that certain gods and angels are often depicted with wings to denote their divine position as holders of spiritual wisdom. 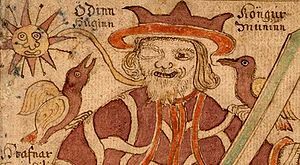 There are also the deities that have bird heads, like Thoth and Horus, and those that are accompanied by birds such as Odin is with his two ravens, Hugin and Munin. There are many more examples that I am sure you will be able to think of. From Greek mythology there is the blind prophet Tiresias, who, in one of the stories associated to him was struck blind by Athene for seeing her bathe naked in a pool, but after hearing a plea from his mother Chariclo, Athene shown some mercy and granted him the power to understand the language of birds. In Three Books of Occult Philosophy. Book 1. chapter LV. Agrippa mentions that “Melampus and Tiresias, and Thales, and Apollonius the Tyanean, had excellent skill in the language of the birds”. He also says; “Democrituss who declared this art, as saith Pliny, by naming the birds, of whose blood mixed together was produced a serpent, of which whosoever did eat, should understand the voices of birds. 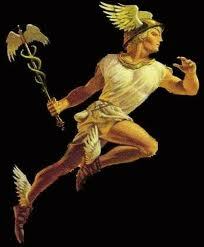 And Hermes saith, if anyone shall go forth to catch birds on a certain day of the Kalends of November, and shall boil the first bird which he catcheth, with the heart of a fox, that all that shall eat of this bird, shall understand the voices of birds and all other animals”. There are many adepts throughout history such as philosophers, mystics, magicians, alchemists and poets who have made use of this language in their writings. So here are a couple of workings that I did ten months ago which involve the use of communicating with the angel and spirits of the day from the Heptameron. I decided to use my dreams as the medium for contact because it felt right too, and plus, I could also bypass the influences and desires of the conscious mind. This was because I was keen on seeing if the allegorical interpretation of the spirits nature was going to work without any conscious influence that may effect the visions on my part. The following extract is taken straight out of my diary, so please excuse it if it does not read to well at times. 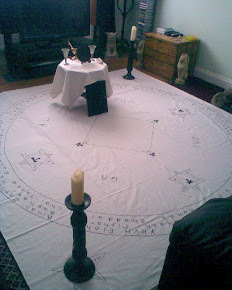 I have also added to my diary extract for the purpose of those reading this blog the opening ritual I used for these workings, and the conjuration which I used and recited straight from the Heptameron, along with an addition to it of the names of the spirits of the air of the day that I sought contact with. This additional call template at the end of the conjuration was taken from Joseph C. Lisiewski's book; Ceremonial Magic & The Power of Evocation. Then suddenly it dawned upon my awareness that these attributes sound like spiritual qualities that are used to lift one out of the desert, or the wasteland of the unproductive mundaneness of the lower nature. After checking through my notes and some books I have, I appear to be right! Now the angel of this invocation, Michael, is the power that leads oneself from the imprisonment of the lower nature. i.e. The deliverer of the soul from captivity. This makes sense when seeing pictures of Michael trampling on top of Satan. And therefore healing one or delivering oneself from infirmities of the lower self. i.e. The lack of completion or lack of perfection in the qualities of the soul. Michael and the spirits of the air of Saturday are the ones who can lead oneself to gold (spiritual qualities) i.e. divine wisdom and spiritual truth. This is exactly what I need, especially after how I have been feeling lately. Down and very depressed with no interest in anything! Bedtime calls and so does a heartfelt invocation to Michael and the spirits of the air of Sunday. Purpose : Asked for healing to begin, and to lead me to the truth and the spiritual gold, to be led out of the desert I am currently in, and to be free of the infirmities that effect me. Invocation of the secret flame taken from the teachings of the Aurum Solis : Thee I invoke the secret flame that abideth in holy and luminous silence. Thee, the light of the great gods and the life of the worlds, Thee the mighty and shinning one whose spirit filleth all things and whose holy fire is invoked in every sanctuary of the heavens. Solar Adoration : Salutation and praise unto thee, O life-en-kindling Sun, Child of Creations Lord, O thou lone all seeing eye of the vault celestial extend thy light that I may see, but dim thy glory that I be not blinded, unmask thy countenance O god of light for I am a lover of truth, and I would behold the spiritual essence concealed by thy golden disk, so reveal to my perception that shinning and inmost nature, even that high spirit which infuses thee and is one with the primal flame of mine own being, O life en-kindling Sun, child of creations Lord salutation and praise unto thee. Qabalistic Invocation of Solomon followed by a prayer to God asking for success in this ceremony. I conjure and confirm upon you, ye strong and holy angels of God, in the name Adonai, Eye, Eye, Eya, which is he who was, and is, and is to come, Eye, Abray; and in the name Saday, Cados, Cados, sitting on high upon the Cherubim; and by the great name of God himself, strong and powerful, who is exalted above all the heavens; Eye, Saraye, who created the world, the heavens, the earth, the sea, and all that in them is, in the first day, and sealed them with his holy name, Phaa, and by the names of the angels who rule in the fourth heaven, and serve before the most mighty Salamia, an angel great and honourable; and by the name of his star, which is Sol, and by his sign, and by the immense name of the living God, and by all the names aforesaid, I conjure thee, Michael, O great angel! Who art chief ruler of this day; and by the name, Adonai, the God of Israel, I conjure thee, O Michael! That thou labor for me, and fulfill all my petitions according to my will and desire in my cause and business, to send Varcan, tus, Andas, and Cynabal, and all ye, his ministers, and indeed and verily, all ye spirits of the air of Sunday to commence healing to begin, and to lead me to the truth and the spiritual gold, to be led out of the desert I am currently in, and to be free of the infirmities that effect me. Come to me this night in my dreams to show and teach me that which I ask. So be it. Amen. Closed with Qabalistic cross and went straight to bed. I was in some kind of warehouse shop looking for Persian rugs. I went upstairs to do some kind of task that I was given to do. There was a man who had lots of rugs for sale and he gave me his phone number, telling me to call him any time. He was very tall and slim, possibly in his late 40s, I remember feeling slightly anxious around him, for want of a better term. On the way out of this place two boys came in, they were friends that I new and were twins (in my dream). I also seen this lovely big white Persian rug that had three green diamond patterns on it. The pile was in very good quality. Dream 2. I was in a swimming pool watching these men and boys play water polo. One lad with blond hair was hit on the forehead, which made him bleed. He was fine though. Dream 3. I was with a woman I know who is about the same age as me. I remember her laying on her side, but sat up. She had stomach-ache. I offered her something to eat which contained 3 ingredients, and I told her it would make her stomach-ache go away and feel much better. And so she started to feel better after eating it. The warehouse was my state of mind/life, looking for spiritual qualities which were symbolised as Persian rugs. (because Persian rugs are an expensive luxury that I am very fond of and I like to collect) The walk up stairs to a higher level means searching for a spiritual answer, or raising my consciousness up a level to do a task, which symbolised the magical working I did to receive guidance from the spirits. The man I met upstairs is most likely Varcan. He gave me his phone number which symbolised establishing contact, and offering to me his communication. The twins who I new and were my friends, with me included, represent the interaction of my mind spirit and soul working or coming together harmoniously. The 2nd dream shows the activity of thought that is operating on the emotional level which is symbolised as water. Here the mental forces symbolised as men and boys represent the forces at play together in the emotional level. The boy who had been hit in the forehead and was bleeding possibly represents the spiritual eye of the young inner divinity that has been activated within me, because blood is the symbol of divine life manifested on the physical level. The woman in the third dream is representative of my physical level of being (in symbolism the female always represents the material manifestation of a force) that I was trying to heal by giving a triple form of manna. This was divine sustenance. The dreams show an interesting order of development, because they start in the higher mental realms where I met the force I was seeking to contact to help me gain the spiritual knowledge I was after. After this the second dream shows the manifestation of the forces coming down a level to the emotional-astral state shown as water. After this in the third dream is where the healing on my self starts, which is on the lowest level of the physical. This was implied by the woman laying down on her side where she started to feel better after receiving the spiritual nourishment. The following day after this rite I had recorded in my diary that I felt a lot different, like a new person, because the depression and negative mood had totally gone, and I had felt so much more positive. In fact I remember feeling quite amazed at the significant change in my state of mind that literally happened over night! I continued working with all of the invocations of the angels and the spirits of the day until I had completed the seven workings. I gained a lot of information about myself and my spiritual development from these rites. The whole process was one fantastic initiation. The Spirits of the Air of Saturday are subject to the south-west wind; the nature of them is to sow discords and hatred, evil thoughts and cogitations; to give leave freely, to slay and kill everyone, and to lame or maim every member. To create an internal conflict within the lower nature to subdue ignorant ideas. To contemplate and think deeply and therefore allow time to heal which results in victory because the false illusions and ignorant ideas and desires have decayed and dissipated over time. The old has been taken away in order to make way for the new. This is the process of growth, which is gained by experience over time which leads to the decline of the old in order for the new spiritual state to develop. Without cutting off the old forms the divine nature would be restricted in the old forms which would limit its manifestation. Purpose : To teach me to recognise the ignorant ideas and desires that are limiting factors to my spiritual development. Teach me the process of growth through the experience of time to cleanse my lower nature so that it becomes free of all unhealthy things, in order for it to be a fit receptacle for the influx of divine power. And teach me how to use the energies of Saturn in a magical way to enhance my spiritual development. As with the previous conjuration of Sunday, this conjuration was repeated 3 x asking Cassiel to send forth Maymon, Abumalith, Assaibi, Balidet, and all his ministers and spirits of the air of Saturday. I was observing a couple this time, a man and a woman who were married, and they were magicians. They both had dark hair and were a little older than me. The woman had moved to the town where I live, and her husband stayed with his father in the week, and worked from there. He came home at the weekends to stay with his wife. While realising this, the woman was telling me about her magical practices she does, which I think involved the use of plants and herbs. Next dream I was in a room of my home on the ground floor looking outside, which was a bright sunny day. I then seen an old friend who ( in my dream) had the same name as me. He walked past the window outside and went into a shed outhouse building. I didn't want him to see me, so I lay down on the floor to hide myself out of site, hoping he hadn't seen me. I lay on the floor looking up at the TV, while thinking that the person I didn't want to see was going to get some drugs. Next I got up off the floor and looked on the side unit where there were lots of drawing pins with the points turned upwards. I think I remember brushing them off the side into my hand to put them away. The 3rd dream is a bit more vague. I was with my mum and I took her into this house that I think was my mum's house, so that she could talk to the subconscious mind while I was going to wait for her in another room in a different part of the house. In the 2nd dream I was in a room of my house on the ground floor, which represents a level in the lower nature, hence why I was on the ground floor. Seeing someone with the same name as me who went into an outside shed to get some drugs, signifies an old negative aspect of myself that I want to shut away and not be effected by. Not that I take drugs, because I don't, as I view drugs in a negative way now, and hence why I gave up smoking cannabis eight years ago. So therefore the drugs must have been a symbol to represent the negative forces of my old self, or the lower nature which I did not want to be influenced by, and hence why I hid out of the way. Here is the advice on how to work with the energies of Saturn. i.e. Invisibility! The pins pointing upwards on the side unit may represent the aspect of my thoughts which are now concentrated in an upward direction towards spiritual matters which I gathered in unto myself. The 3rd dream possibly means that my spirit is guiding the material aspect of my self (symbolised as my mother) to successfully communicate with the deep mind or the soul to receive knowledge for my spiritual development. The two separate rooms probably represent the two aspects of the higher and lower nature, where each part of the higher (spiritual) and the lower (material) self reside in. After realising the significance of using invisibility for magical development, I thought I needed to investigate this a bit more, because it made perfect sense according to the allegorical interpretation, and it felt right too. For why would sacred books of magic like the Key of Solomon call upon divine names of God to work at becoming literally invisible. This never really made sense to me, and I always thought that there was more to it than at first meets the eye. So after receiving this information I opened up Mather's version of The Key of Solomon to look at the invisibility spell. Believe it or not the book opened up on the exact page on the first attempt. This is nothing special, as it is quite a common occurrence to magicians when they are searching for something in particular, but still, a tell tale sign I was heading in the right direction. What I found interesting about this spell was that the waxen image was to be made in the month of January, and in the day and hour of Saturn. Now considering the Saturnine working I had done to receive this information, I thought it was rather intriguing, especially as I had not remembered the details because I had not read it for a long time. So off I set to meditate about the significance of why it was to be done in the month of January. Shortly into the meditation the realisation came to me that the month was not meant to be taken literally. Instead, if we take the “as above so below” Hermetic law, then the course of a year of the Sun's movements is the “above”, or exoteric (outer) perspective. The “below”, or esoteric (inner) perspective is that the Sun represents the divine part of the soul, the inner divinity of the magician. Now towards the end of December the Sun enters Capricorn the goat, the symbol of the animal nature which is the lowest level that the soul falls into when it comes down from the empyrean. Just like on the winter solstice which is the shortest day of the year when the Sun enters its lowest point in the sky. Three days later around the 25th December the Sun is reborn and the daylight hours start to increase again, although the length of darkness still holds dominion over the daylight hours until the spring equinox in March. If we internalise this and apply it to the magician's inner spiritual nature, we can say that once the magician has started to awaken his or her divinity then the powers and forces that effect and rule over the lower nature are still stronger because the inner divinity is still to young to deal with them. This is emphasised in such myths as that of the infant Horus who was placed in the Papyrus thicket by his mother Isis, to keep him hidden away from Set until he had grown strong enough to claim his father's throne. A very similar theme is found in the story of Moses when his mother also hides him from the Pharaoh. There is also the stories of Dionysus who as an infant was kept hidden from Hera. Taking all this into account January is the the time that comes after the the rebirth of the Sun, and therefore metaphorically speaking it is the symbolic period after the magician has awakened his or her inner divinity of the spiritual nature. So as the spiritual self starts to grow and develop from out of the lower nature, it needs to not to be hindered or influenced by the forces that effect and rule over the lower nature, which could easily prevent the soul's growth and spiritual development. It is no wonder that the first day of January is consecrated to the Roman two faced god Janus; the god of doorways, new beginnings and transitions. He has two faces because he looks back into the past of the old year; symbolic of the lower self, and into the future of the new year, which is symbolic of the new spiritual self. Over the course of this week I will post up a couple more of these workings I did with the Heptameron spirits. Although I have adapted these workings to a method suitable for me to use, I got a lot out of them that shown me I was on the right track by interpreting the nature of these spirits allegorically. Greetings, Darren. I find great agreement in your sense of the allegorical tradition, and the deep layers one can immerse/merge/emerge through magical application. I especially enjoy your examination of the turbulance and flux that provides much of the tension we have to assume and transcend to get to the state where grace can flood our sensual perspective, providing the means for our spirit to be weightless again. Your grasp of history and neo platonic application to the grimoire traditionis consistantly provides great reflection along the themes you explore, an I appreciate that very much. Thank you Dan for your kind words. I am really pleased that my writings have such a positive effect for you. I have been a bit too busy with stating college lately and writing essays for my courses I am currently studying. But I will be adding a fair bit more to my blog soon, explaining more of the allegorical interpretation, and how it is applied to the Grimoire Tradition.